I just want to say that I’m really happy right now that I can continue to write about our trip on the blog right now! Let’s take the story behind a little bit to understand why. We left Philadelphia and we rolled toward Tennessee since we had a few days off because off the All-Star break. 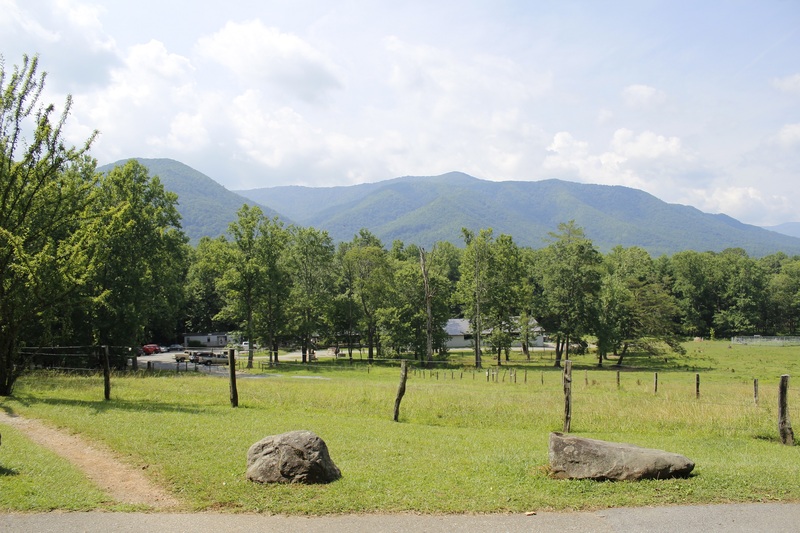 Our first stop was in the Great Smoky Mountains. This (huge) national park is the park that received the most visitors in all the Americans National Parks. Also, there is no entry fee! A few days in the nature with no Wi-Fi would do us great plus we are really a good team when we go in camping mode! Next stop is Nashville! We didn’t have a lot of time to spend in music city but it really was worth it. We’ll describe the downtown for those who never been there: one big street, thirty-forty or more bars, all with a live performing artist or band playing all day long different kind of music but mostly country and bluegrass. It’s exactly how you imagine it as a tourist! 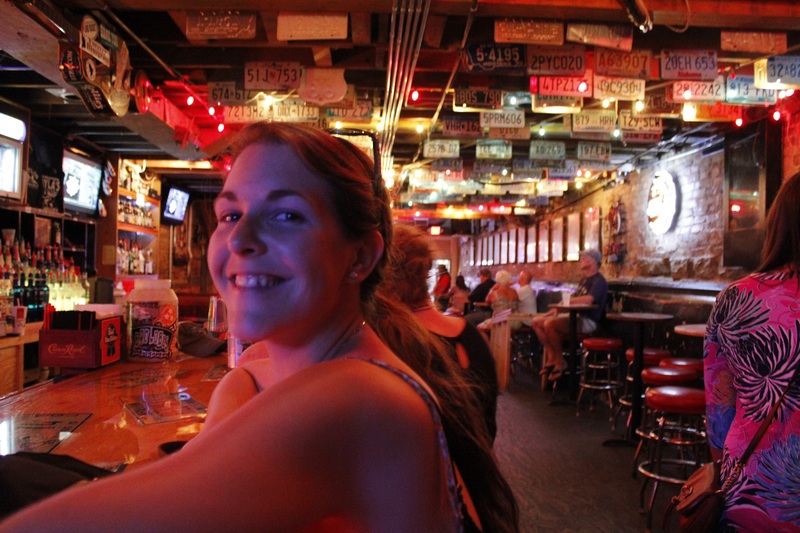 This doesn’t mean the experience is not good; we spent the night in different kind of bars enjoying music. We always loved bluegrass. Our other activity was to eat some BBQ. 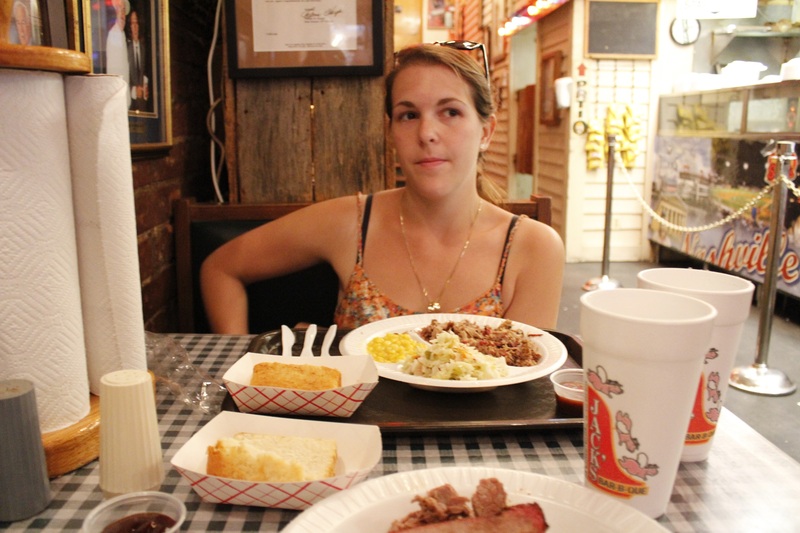 Thanks to Martine ad Fred that recommended us Jack’s BBQ. Cafeteria style, big portion, corn bread and three choices of sauce! We left Nashville and we rolled towards Chattanooga for the last few days of our break. We only had one stop: Jack Daniel’s Distillery in Lynchburg. The distillery kept his old style in the middle of a very small town. 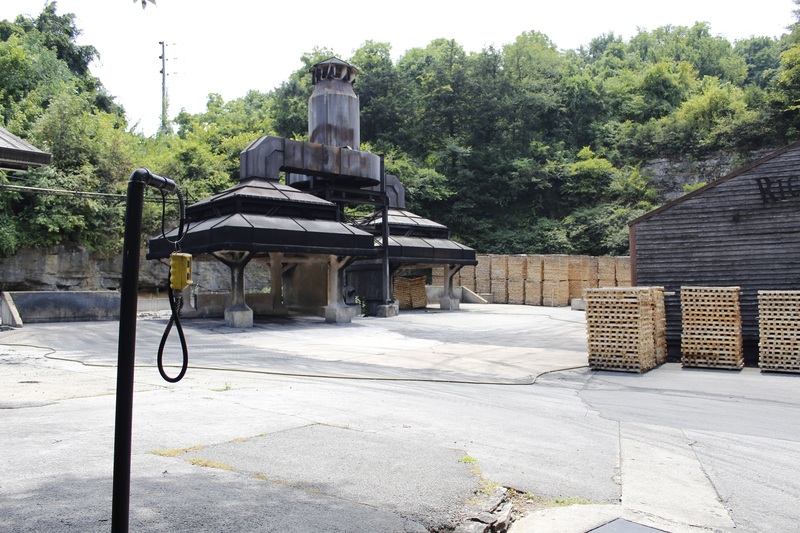 Every drop of Jack Daniel’s Whisky is distilled here! The free visit is long enough (1 hour) to see every step in the creation of this product from the creation of the charcoal to the bottling. Lynchburg is a Dry county so it is illegal to sell alcohol there. Fortunately, at the gift shop, you can buy very nice glass bottles and it happens that those bottles are filled with a free liquid! 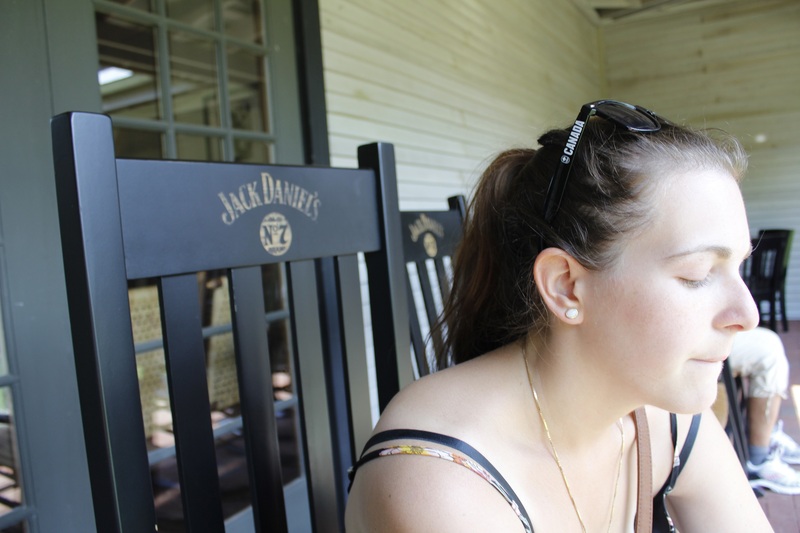 We strongly recommend the Jack Daniel’s distillery visit. We left Chattanooga to go back to our friends Meg and Brian in Washington to (finally) see a Nationals game (We had a rain check on July 8th when we were at Nationals Park). On the road, the minivan transmission broke down on the Interstate and we had to get it towed to a Ford dealership in Bristol, Tennessee. The next day they called us to tell us what would be the cost of the reparation and we were devastated. Furthermore, the reparation delay would make us lose 7 days and this would mess up our whole schedule. So we turned to the social Medias for help and help we got! We are sending you guys the biggest thank you ever. It is because of you that we are on the road and we will keep our project moving. Also we could find a garage that could do the repair for a little cheaper and faster! They gave us a really good service. So we were sitting docks for a few days and Tuesday July 22nd we were back on the road. About the Nationals game, we are not sure if we will be able to make there before the end of the season. We have a few opening like if the Nats would go into the postseasons we could drive down after our last ballpark to go catch a game there. If we can’t make it, we spent 6 hours in the Nationals park when we visited and waited for the game to be cancelled. 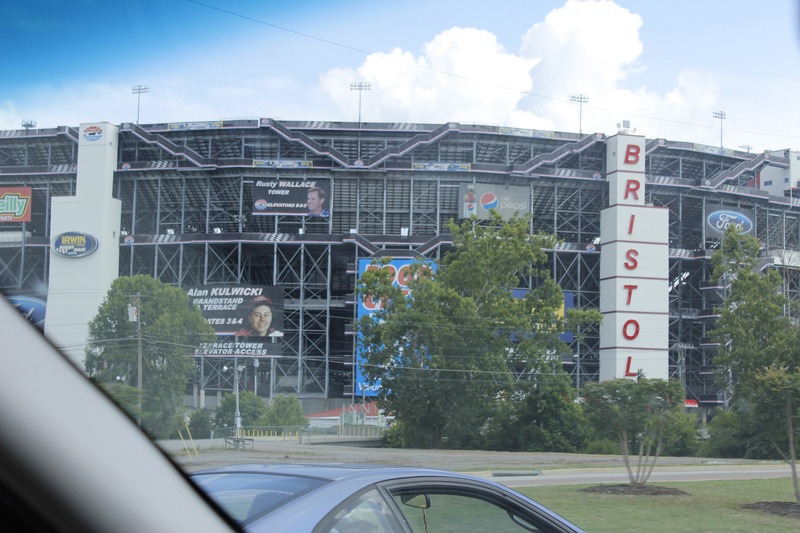 During this time we visited the park and we had long discussions with Nationals fans in there so we have enough materials to write a full report about the fans and the ballpark. We even got pictures! 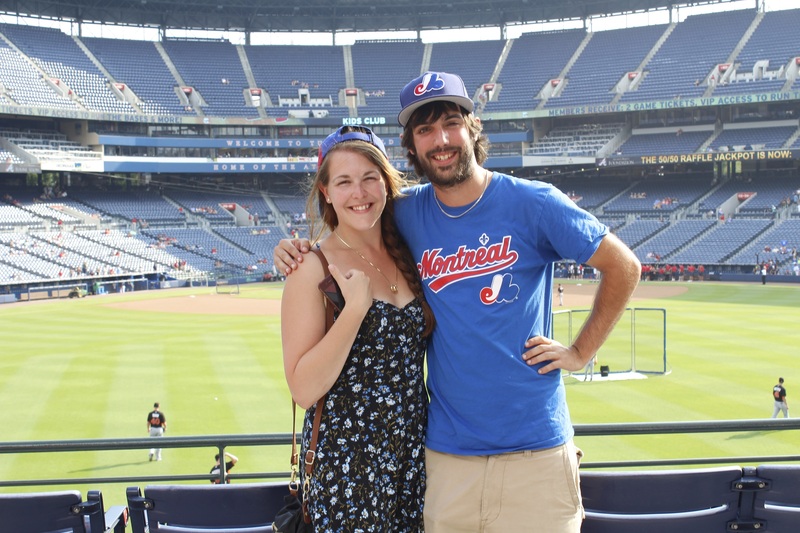 While we were waiting in Bristol, Kirby and Jennifer, two big Atlanta Braves fans (and ballpark chasers! 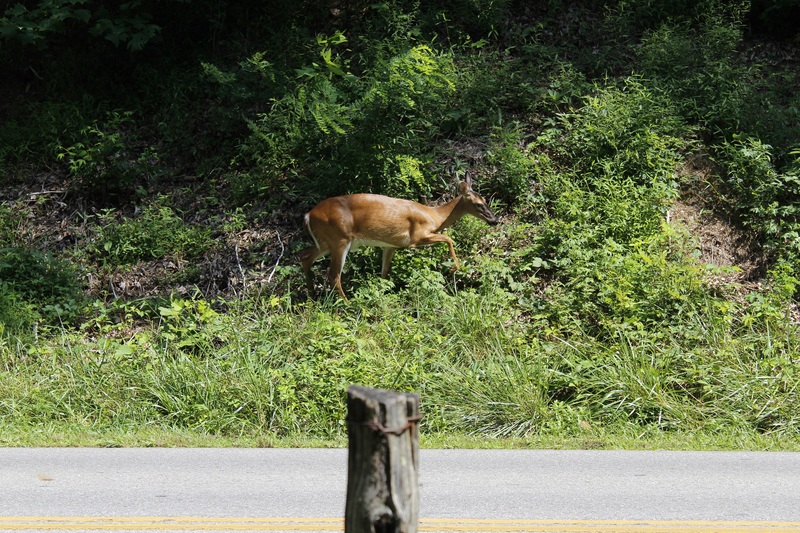 ), offered us lodging before our braves game on the 24th. The four of us talked a lot about baseball and American history. They explained us a lot of things about the Braves and their fan. First thing, the Braves fans are covering a really large area: Georgia, North and South Carolina, Tennessee, Mississippi and it goes north almost as far as DC! Also, being a city with a lot of big companies’ head offices, a lot of Americans will move to Atlanta and fill the seats of turner field being baseball fans in their hometown. Kirby and Jennifer told us that there are also a lot of older fans that have known the team since they got to Atlanta in 1966. 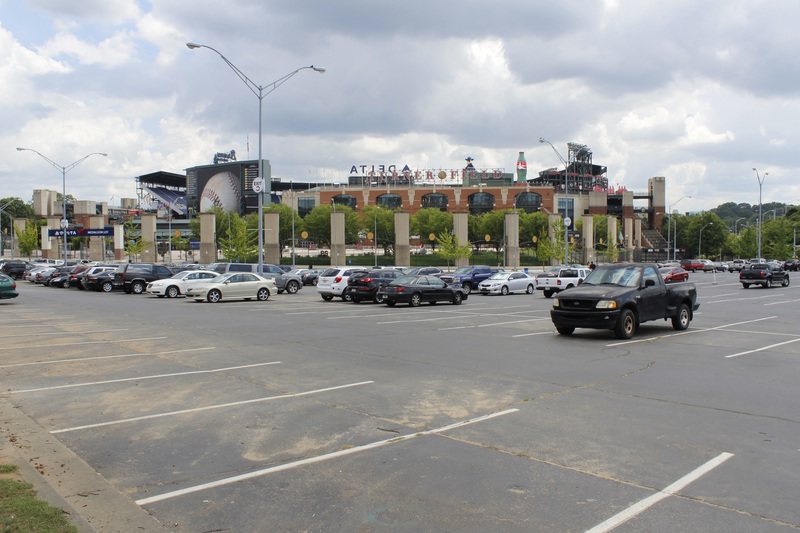 They also described us all the special features that we can see or visit when we’ll get to Turner Field. All of the particularities that enhance the fan experience. Jennifer and Kirby where coming back from a baseball trip to Wrigley Field and Progressive field. They gave us great advice about our trips and it was really nice talking with fellow ballpark chasers. We want to give them a huge thank you for the lodging meal, braves goodies and great discussions! 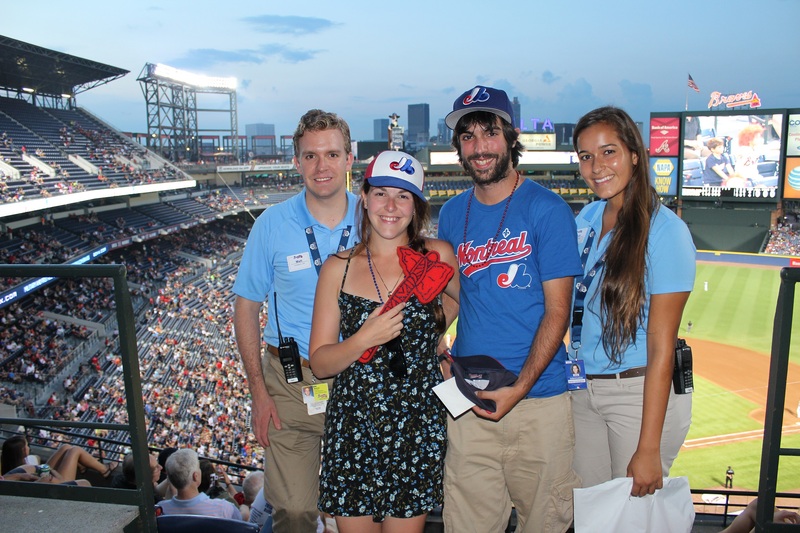 We gave them expos t-shirts: wear them proudly and we both hope to see you in Montreal in a near future! The next day we left Toccoa (for those band of brothers fans: Currrahee!) to go to Atlanta. 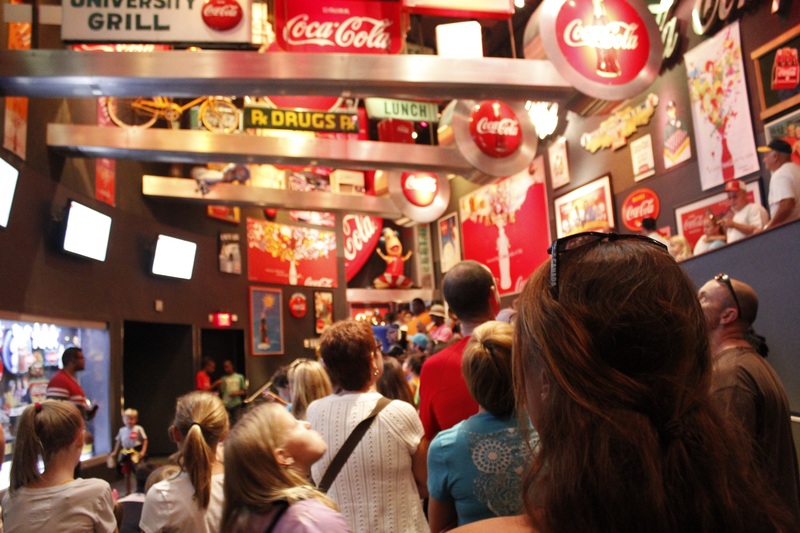 We took time to visit the Coca-Cola World (Adry is a big fan of that drink!). The visit was really nice (tacky at some moments) because we could see the history of the drink, a bottling line slowed down so we can see all the steps and naturally the big tasting room at the end! 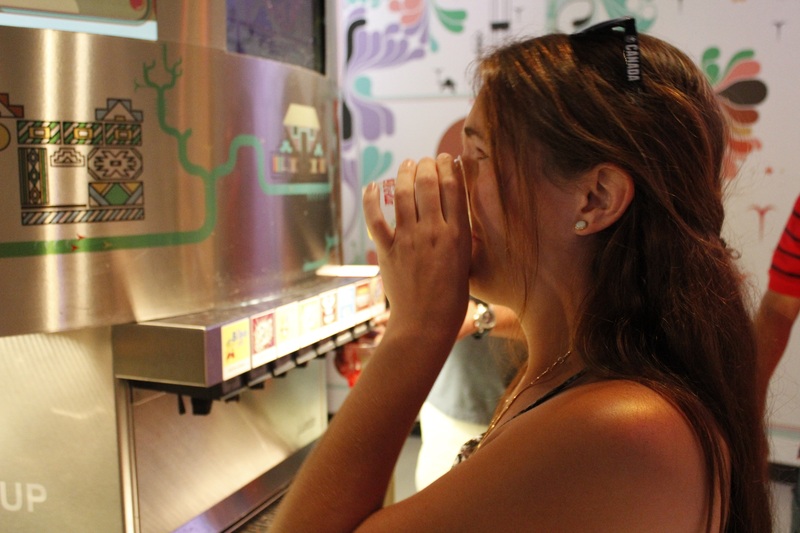 In this room, you can taste over 60 different soft drinks (self-serve!) You can taste drinks from China, South Africa and Latvia! Let’s say a visit to the restroom was needed right after! We decided to arrive early at Turner Field for two reasons. First of all, in the parking lot, you can see the walls of the old stadium (1966-1996) as well as the bases and home plate. 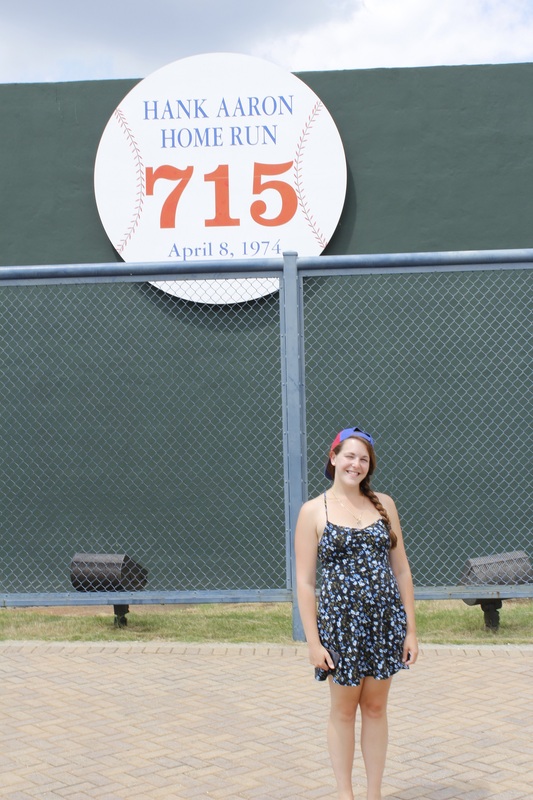 Also they left a fence and a big sign were Hank Aaron hit his 715th homerun to beat Babe Ruth’s record. Secondly, we arrived early because our friends from Toccoa told us about the Tailgating experience! 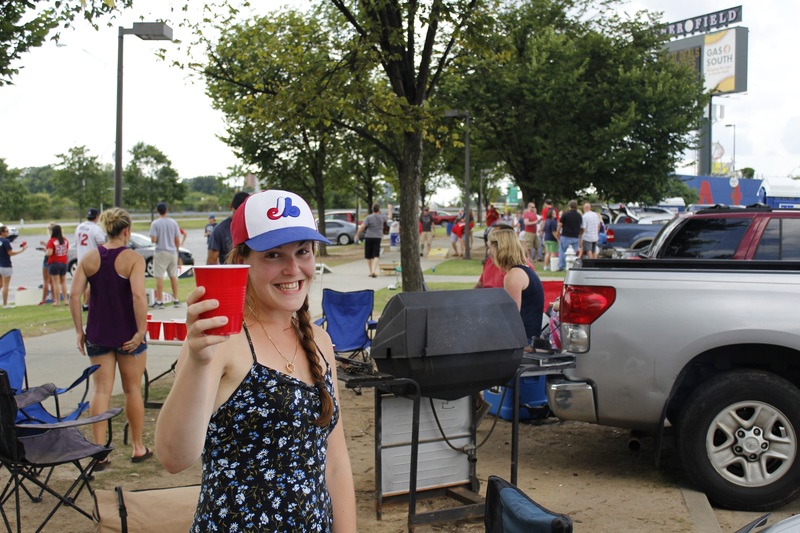 For those who don’t know about tailgating: It is the act of partying before a sports event directly in the parking lot: bring your own beer and Grill. We realized that people were really in a party mode for a Wednesday afternoon: beerpong to our right, lot of alcohol to our left! 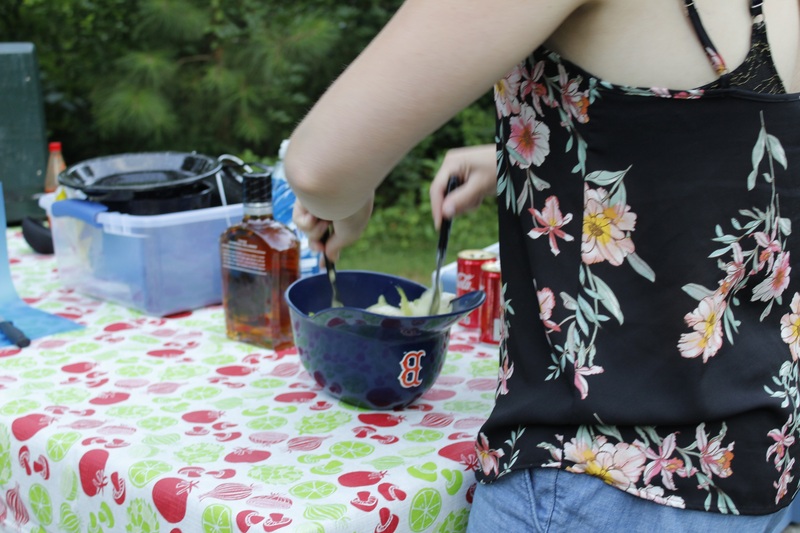 We had the chance to talk with some Braves fan that told us that during the summer, any night, people are partying and tailgating before the games (even a Monday!). When we got into the ballpark, that is going to be replaced in 2017, we felt that the people were all nice. It was a nice welcoming. 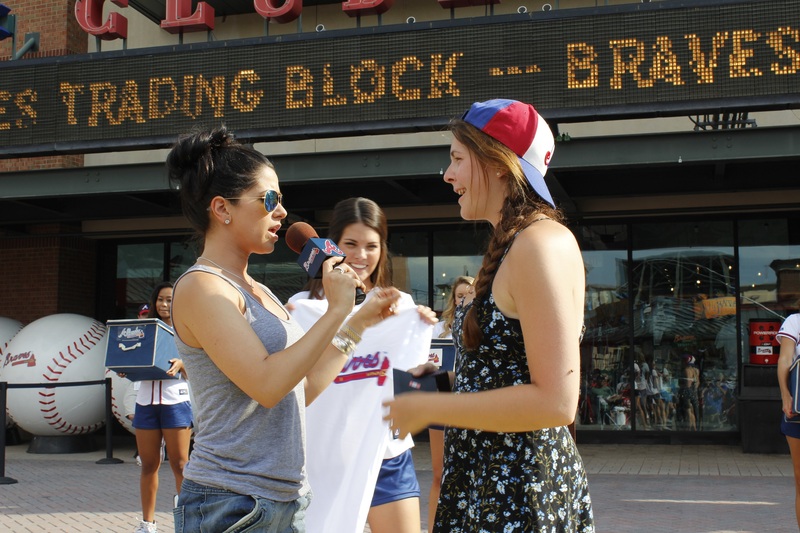 Adry won two tickets to a six flag park in a contest that we traded for a braves t-shirt! 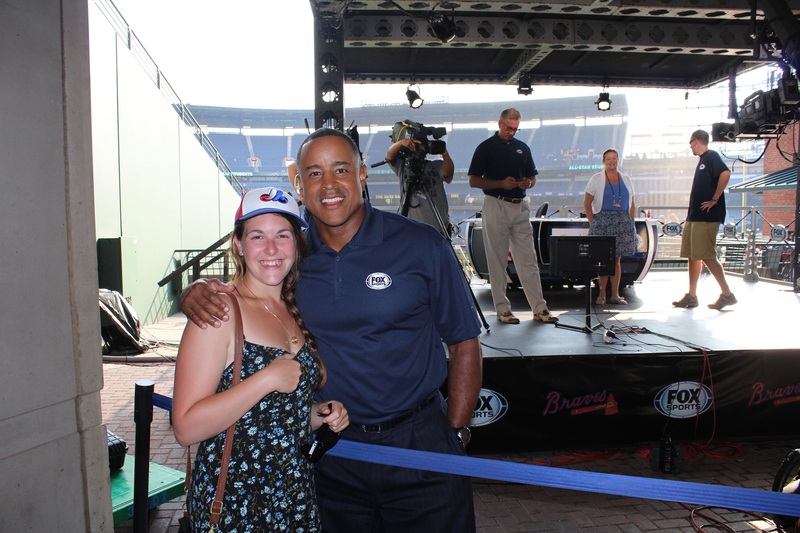 We had the chance to talk with employees that have seen the Expos play at Turner and Adry even got a picture with Briand Jordan, an ex-braves player working for Fox Sports south. 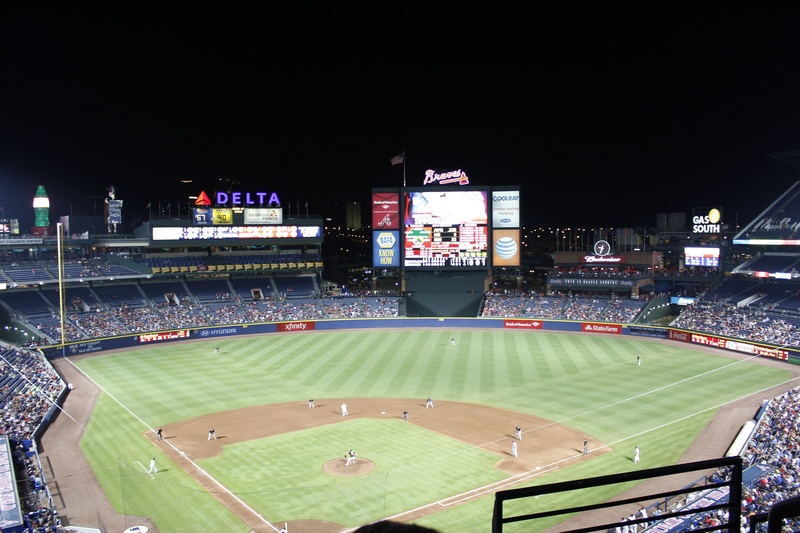 We took our time to tour the stadium to see all the attractions: batting cage for kids and adults, kid zone where they can run bases, big Coca-Cola chairs with a view of Atlanta downtown, sports bar with a view on the center field, etc. On the other side, we thought that the inside of the ballpark wasn’t pretty. The food vendors were not offering a big variety of meals and drinks and finally, there weren’t a lot of fans in the stands. We also could understand that this very young ballpark is going to be replaced (1996-2016). We walked around a little bit to get some drinks and you don’t feel safe walking around the ballpark and we’ve been told about big traffic jams after the games. We really want to thank the Braves for their welcoming to Turner field. 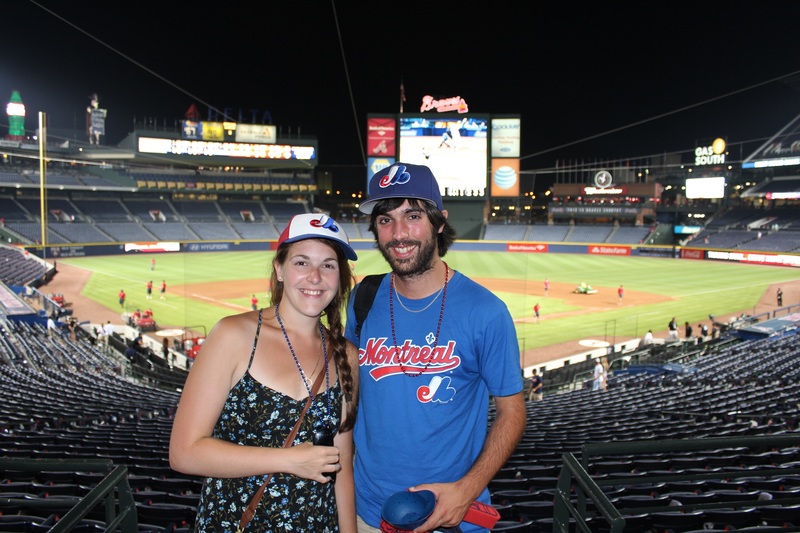 We know there is a big history between the braves and the Expos so it was special for us to be there. They answered to our multiple emails and they sent us Braves guest services ambassadors that gave us gifts and took the time to talk with us! Yes it was a really hot nigh in Atlanta but we had a great experience in Turner field. Once again we saw, a stadium with a view of the downtown. It always reminds us of what we could’ve had in Montreal. We really enjoyed all the little features and attractions in the ballpark. We were wondering: what did we had back at the big ‘O’ that made the ballpark special? We ask you! We are starting to get a lot of ideas of what we should have In a new ballpark that could make the fan experience special. We were really happy of the welcoming we got there and they fans were extra nice. Those who knew the expos all wished us, like everywhere else, to get a team back. We surely will return to Atlanta later in our life to go see a ball game in their new stadium! Until them, we’d like to congratulate the Braves for the induction of Tom Glavine, Bobby Cox and Greg Maddux to the Baseball hall of fame! Next stop : Tropicana Field and the Rays! 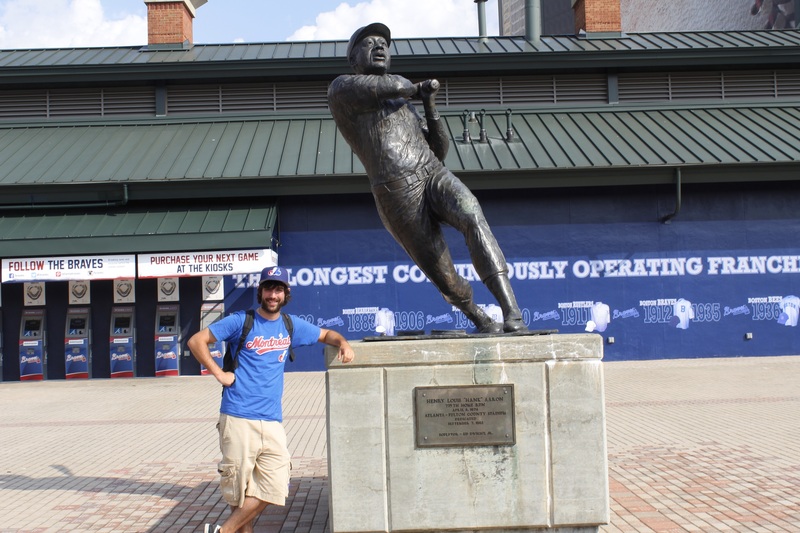 I am soooo glad y’all (yes, y’all…hahaha) had a great time at the Turner!!! We had an awesome time talking baseball & history with you both also. You can stay with us anytime! We have been talking about changing next year’s baseball road trip from California to Canada!! We are looking forward to the remainder of your trip. Have fun!